Hanna hanna bo banna bo nana nana fo fanna. An energetic and enigmatic story about a girl who has been raised in isolation with her CIA agent father to become a perfect assassin. I have to say that I enjoyed this in all of its implausibiity. But really, its not that much more unbelievable than any other super spy movies. I’m sure that Jason Statham probably read for the lead role of Hanna, but his contractual requirements for taking his shirt off would have been frowned upon. For one, is would have pushed the rating from PG-13 to R because he would have been female – and For two, the character is 16, and no rating would have had a 16 year old girl taking off her shirt — not even if she’s played by Jason Statham. With movies like Atonement and Pride and Prejudice under his belt, it doesn’t seem like Joe Wright would have been the first choice to direct an intense spy thriller. Rumor has it that child actor Saoirse Ronan requested that Wright be the director (presumably based on their experience on Atonement). How she got the ability to greenlight a director is beyond me. But Wright does do a great job setting things up, and then keeping the danger and tension high. Chameleon-like Cate Blanchett is frightening as the CIA operative after both Hanna and her father. Eric Bana seems to intermittently channel Arnold Schwarzenegger. Cinematography and editing are top notch. One must also point out the that fight choreography is pretty stunning. The problem that I mostly have with it is that its just a bunch of vignettes of action without much cohesion (much like Arthur, but without Russell Brand). Here we have a girl that has been raised with only an academic knowledge about the world, being set free into that world. There are some places where we see her looking at everything with fresh eyes, but really I would expect more. Hollywood storytelling requires the hero to be “irreversibly changed” by the end of the story. 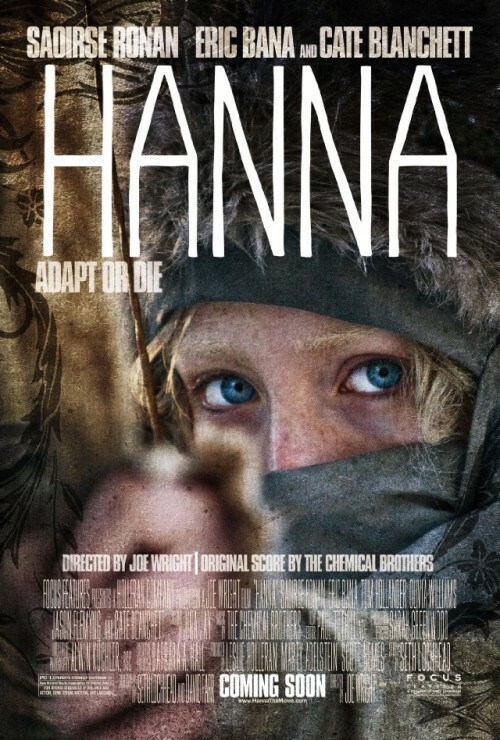 Our hero, Hanna, doesn’t seem to change over the course of the film. She starts out as a killing machine spy, and ends up a killing machine spy. She witnesses who she really is, and that revelation does not change her. And there was plenty of opportunity to do that. As a side note, I don’t know why people think that having an emotionless killer whistle a theme song makes them somehow more frightening. In a nutshell? Pretty cool to watch. But in the end, it doesn’t have much to say.